Stephen Suleyman Schwartz, Susquehanna University, Selinsgrove, Pennsylvania, 2011. 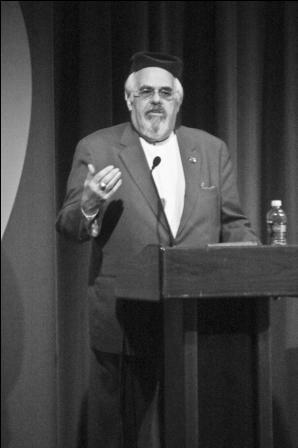 Journalist Stephen Schwartz presented his lecture titled "Islamophobia: America's New Fear Industry" on Nov. 1 in Isaacs Auditorium in Seibert Hall. The presentation addressed common misconceptions regarding the Islamic religion that have resulted in what Schwartz termed "an irrational fear of Islam." Born in Ohio to [a Christian mother and Jewish father], Schwartz was raised as an atheist despite having a fascination with religion. "My father's family was killed during the Holocaust, and consequently he was afraid of religion," Schwartz said. "I, however, [became] a secret believer in God," he added. For his ninth birthday, Schwartz asked his parents for a Bible. The request was met with hesitance on the part of his parents, but they conceded and purchased a Bible that was to be kept in the living room exclusively. Forty years later, Schwartz had found the religion he was looking for. In 1997, Schwartz was stationed in Bosnia [by the Council of Europe] while with the San Francisco Chronicle, where he made a name for himself as a prominent reporter. Schwartz said he was impressed by the peaceful nature of the Muslims who showed no desire for retaliation against oppressive [ex-Yugoslav] government[s]. "All they wanted was peace and independence," Schwartz said. It was during that time that Schwartz, [who had] bought a Quran, learned more about the Islamic religion. According to Schwartz, he immediately found a connection with the religion. "I had finally found the religion I was looking for," he said. 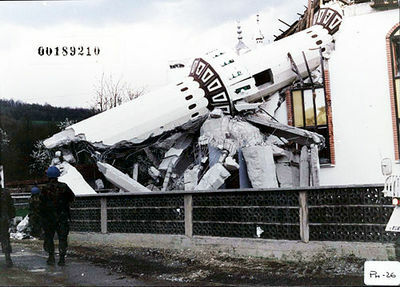 Bombed mosque in Ahmići, Central Bosnia,1993 -- Photograph Courtesy of the International Criminal Tribunal for Former Yugoslavia (ICTY), Den Haag. Schwartz discusses Islam as a religion misunderstood and misrepresented by many people around the world that lack an understanding of Islamic values. This is due in large part, Schwartz explained, to constructed fear built on the basis of actions by a minute number of Muslims coupled with a shortage of knowledge regarding the religion. "Knowledge of Islam in America prior to 2001 was sparse," Schwartz said. "Most Americans seemed to have discovered the existence of Islam and Muslims in the aftermath of one day of fear ten years ago," he added. Schwartz said that he credits a combination of variables for the existence and expansion of Islamophobia, including but not limited to America's search for a scapegoat to explain the international financial crisis, as well as journalistic sensationalism that sacrifices education of Islamic culture in order to sell headlines. "The fact of the matter is that the truth doesn't sell," Schwartz said. "A headline that reads, 'The vast majority of Muslims practice moderate Islam' is not going to sell the way 'Soldier beheaded by Muslims' is going to sell," he said. He noted that "virtually every Muslim government condemned the attacks of 9/11." Schwartz repeatedly emphasized the notion that radical Islam is a belief inherently different from moderate Islam, and that those Muslims with a radical interpretation of the Quran are guilty of hypocrisy, the greatest sin a Muslim can commit. Schwartz theorized that in addition to media sensationalism, the international financial crisis played a significant role in the rise of Islamophobia. He said that he was proud of the way most Americans initially reacted after September 11, and it was not until 2007 that he observed significant intolerance on the part of Americans regarding Muslims. That said, he acknowledged the foundations of Islamophobia being laid immediately following the attacks. Schwartz commended former President George W. Bush for his public remarks following the attacks, but recalled that people within his own party criticized him for the same remarks, creating a rift. "George Bush was absurdly criticized for being 'weak' when he said that 'Islam is a peaceful religion that has been hijacked by the actions of radical extremists,' and it inevitably rubbed off on other people," Schwartz said. Schwartz took a moment to collect his thoughts before proclaiming, "the actions of 19 crazy people should not cause us (Muslims) to give up our book." In the final part of the lecture, Schwartz cautioned that Islamophobia and the fear that it is breeding will result in even more violence if it is not contained. "The Islamophobe is a fear merchant, in that he profits from conflict," he said. "The Islamophobe gets attention because of conflict, he sells books because of conflict, the entire movement requires conflict," he said. Schwartz further went on to explain the relationship of mutualism that exists between the two entities. "The Islamophobe does not exist without the [Islamist] radical and vice-versa," he said, adding that "neither party [gains] legitimacy without the other." As he concluded his lecture, Schwartz left the crowd with three pieces of advice. "Be strong in your [own Christian and Jewish] faith, don't give up your religion, and defend your religion, but defend it with facts," he said.